Wild Turkey has a rough and rowdy reputation, but it’s also and underrated bourbon, with bold, enjoyable flavors. Rare Breed ($40 for 750 ml.) is the same mash bill as regular Wild Turkey 101, but with two twists that set it apart. First, Rare Breed is bottled at barrel strength without being cut with water, resulting in a strong 108.4-proof whiskey. Second, the bourbon is a combination of 6, 8, and 12 year old Wild Turkey (the regular 101 variety used to carry an age statement of 8 years, but has since dropped it). 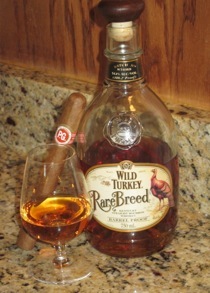 Rare Breed is deep amber in color and the nose features deep oak, citrus, cedar, and even a hint of fermenting tobacco. The bourbon uses a good bit of rye in its recipe and it shows on the palate: with spice and tannins in combination with pine, maple sweetness, and vanilla. The finish is clean with more lingering wood and spice. Even though Rare Breed is a higher than normal proof, it’s still quite smooth and balanced. Usually, my rule of thumb is anything over 100-proof gets a splash of water to tone down the alcoholic heat, but that’s surprisingly unnecessary here, as Rare Breed is quite drinkable straight up. While it’s feisty and flavorful, it doesn’t feature the pure heat that often appears with spirits that are over 50% alcohol by volume. All that spiciness makes it a perfect bourbon for pairing with spicy Nicaraguan cigars. Think: Tatuaje Fausto, Casa Fernandez Aganorsa, or EO 601 Red. Want a Dominican-made cigar? Try the Aging Room Quattro, Opus X, or LG Diez. You can’t go wrong with any of those. But most of all, if you’re a bourbon drinker, don’t forget about Wild Turkey. It’s good stuff (even if it doesn’t have the cache or buzz of harder-to-find bourbons) and the Rare Breed is an excellent expression with plenty of power and guts, combined with just enough finesse and complexity.